Organizers say human error, not Fabo the robot, to blame. 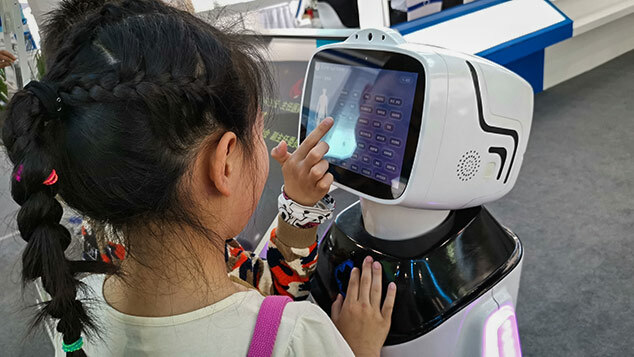 A robot went out of control at a technology fair in southern China’s Guangdong province Thursday, smashing a glass window and injuring a visitor. The aggressor was Fabo, an education and entertainment robot for children. A human error was responsible for the mishap: The person operating Fabo hit the “forward” button instead of “reverse,” according to one of the fair’s organizers. This command sent Fabo off in the direction of a neighboring exhibition booth that was made from glass. The robot rammed into the booth and shattered the glass, the splinters from which injured the ankles of a visitor to the exhibition. Details about the injured visitor were not immediately available, but images circulating on the internet on Friday show what appears to be a middle-aged man lying on a stretcher. After receiving emergency care on-site, the patient was sent to the nearby Peking University Shenzhen Hospital by ambulance and was discharged after receiving stitches. The incident took place at the China Hi-Tech Fair 2016 in Shenzhen, the boomtown that is now a major hub for tech startups. The fair, hosted by the Shenzhen Convention and Exhibition Center (SCEC) for six days through Nov. 21, has attracted more than 3,000 exhibitors and aims to showcase some of the world’s most advanced technologies. SCEC told Sixth Tone that the accident took place on Thursday afternoon and was caused by the human error of a staffer from Shenzhen Spreadview Century Technologies Co., one of the fair’s exhibitors. Shenzhen Spreadview Century produces mini projectors, which it supplies to Beijing Evolver Robotics Technology Co., Ltd., the manufacturer of Fabo. 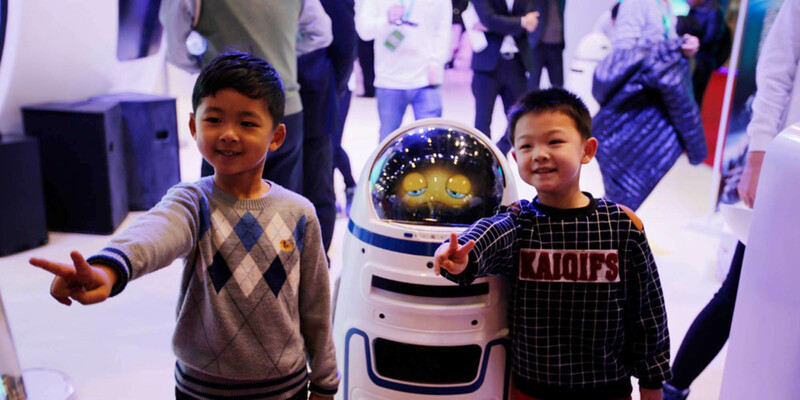 The robot comes in two models: One is designed to serve as an education or entertainment tool for children, while the other is used for commercial purposes such as advertising. 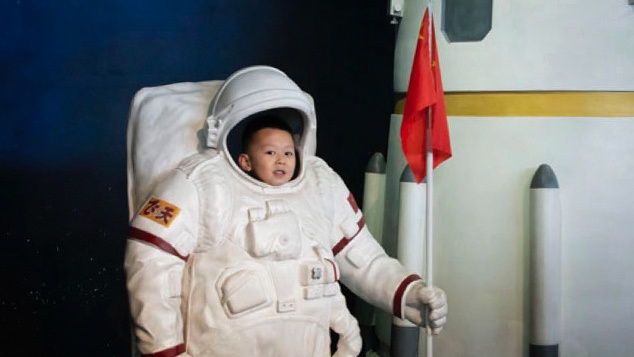 The robot costs close to 13,000 yuan ($1,900), according to the company’s website. An employee at Shenzhen Spreadview Century told Sixth Tone by phone that the staffer tried to pick up the robot, but that Fabo’s weight — 25 kilograms — was too much to handle, and the operator accidentally pushed the wrong button. Fabo’s automatic mode was turned off, which meant it could not avoid collisions by itself, he said. A woman who answered the phone at Beijing Evolver’s customer service center on Friday declined to comment to Sixth Tone, saying that the company would make a statement later. But in a statement that appears to have been issued by Beijing Evolver late Friday afternoon and circulated to media by the fair’s organizers, the company reiterated the organizer’s claims that the incident was caused by the operator. The company had visited the injured person in the hospital and had paid compensation, the statement added. China has recently stressed the importance of robotics as a key driver for the country’s manufacturing sector. Demand for industrial robots is growing in China as more factories embrace automation, and the Chinese demand for service robots like Fabo for use in domestic settings is also on the rise. Leng Xiaokun, CEO of Lejv Robot, another robotics startup based in Shenzhen, said that even if the incident was caused by mishandling on the part of the operator, robot manufacturers should still spare no expense in implementing measures to avoid such accidents. “The principle for robot companies is to make sure that robots, particularly those made for kids, do not hurt humans,” he said.